Documenting human rights violations depends on data. Photos of survivors. Recorded first hand accounts of atrocities. Emails and financial documents from the perpetrators. These materials are all data-driven, and this documentation is essential to the protection of human rights. But if this data is not handled carefully, it can compromise the safety of the people who create, collect, or use it. 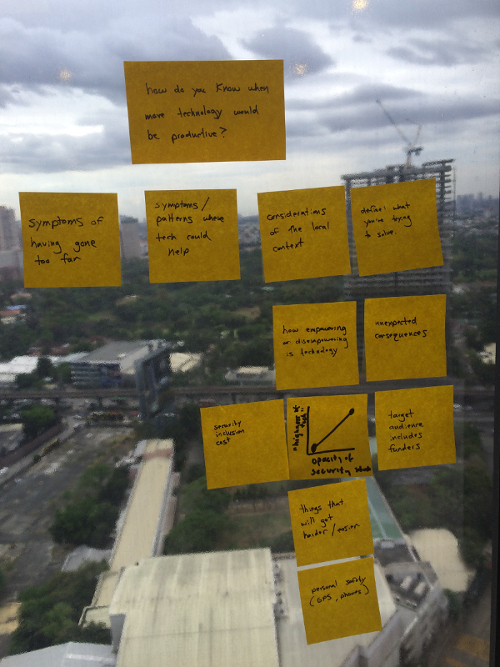 The Responsible Data Forum, held in Manila on March 21 and 22, 2015, brought together human rights defenders, technologists, and trainers from around the world to foster responsible data practices for human rights documentation. This was the eighth Responsible Data Forum held by the engine room, an organization that supports and investigates the use of technology and data in advocacy work. In Manila, I joined small working groups to explore topics such as how to identify appropriate tools and best practices for verifying human rights documentation. I worked with an incredible group of people to explore the challenges of working in low technology environments. We designed our conversation to help funders and developers think through the question of, "Will it be productive to bring technology to a low tech situation?" This past week, I joined Gunner to facilitate the Transparency and Accountability Initiative's "Using Technology to Follow the Money" workshop in Berlin. We met over a hundred activists, journalists, technologists, and funders who traveled from all over the world to have dialogues about how to better use financial data to make social change. What does it mean to “Follow the Money”, and how can financial data lead to social change?